Husband Dawa and wife Kandu lived in a three story house with their children, Yangdi, Lhakpa, Gelu, Phuri, Gyaljen, Pasang, Chhiri, and Kanchha. 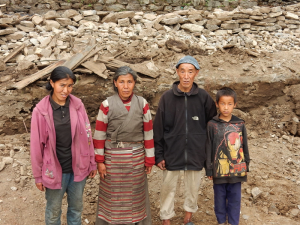 Their house was in such bad shape and so unsafe after the earthquakes that the Nepali army took it down. Now the family lives in a temporary shelter. They have been quite terrified living outside since the first quake and like the rest of the villagers living in a temporary shelters, are worried what will happen during the monsoon rains and winds this summer. They fear the shelters will be inadequate to withstand the onslaught they know is coming. Mud slides, snakes looking for a dry place to live, and ever present leeches are sources for their worries. In the rebuilding of their house they want only two stories built to withstand earthquakes. One story would be for storage and the other for the family to live in.